To put it simply, La Fortuna Waterfall is stunning. People from around the world come to appreciate the natural beauty of the waterfall and surrounding hot springs. Spanish for “Fortune,” the waterfall is the attraction of a number of different tours near the Arenal Volcano and is fed by the Tenorio River. The view of the waterfall spilling out from a cliff at the base of the dormant Chato volcano and plummeting 70-meters (230-feet) before hitting a tropical pond that’s surrounded by the rich, green rainforest along the Arenal Mountain range is an awe-inspiring experience. Visitors come from around the world to appreciate the stunning natural beauty of the waterfall and surrounding hot springs. 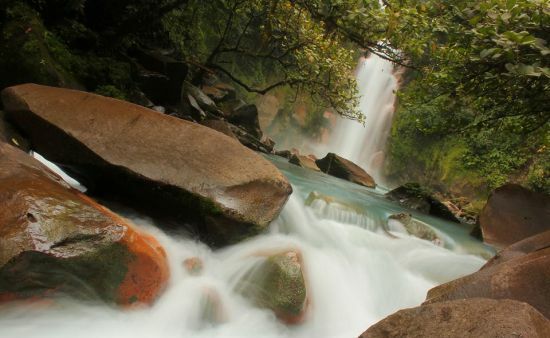 There are two viewing areas that offer different perspectives of La Fortuna, and you can even walk right out on to the massive rocks and boulders alongside the banks of the basin.Remember to bring a swimsuit — the cool pool at the base of the waterfall is a great swimming location on a balmy summer day. The hike from the starting point on the cliff down to the waterfall (which can be combined with a hanging bridges canopy tour) follows a staircase that is carved into the hillside and takes about 15 minutes, and the calm green-blue waters of the pool will make the trek well worth the effort, and among the most beautiful Costa Rican hikes. The Rio Celeste Waterfall in Tenorio Volcano National Park in the northwestern Guanacaste region is renowned for its hypnotic blue color and tropical surroundings. According to local legend, when God painted the sky, he washed his blue brushes in the river, turning the waters an entrancing shade of turquoise. In reality, the water that flows through the park is the unique product of a chemical reaction between minerals from the volcano and lush rainforest. A two-hour hike into the park will unveil the brilliant blue waterfall and several natural hot springs, as well as plenty of Costa Rica wildlife including poison dart frogs, colorful blue morpho butterflies, and curious monkeys — it’s the ultimate tropical adventure. Swimming is prohibited due to unknown effects of the volcanic minerals, but the views make for picture perfect memories to share with friends and family. 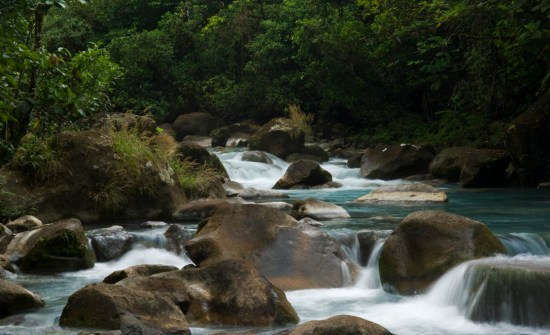 The best time of year to experience the bright blue river is during Costa Rica’s dry season between December and April. 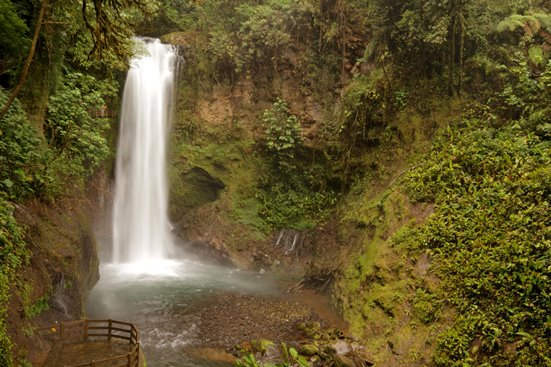 Despite their many alluring sights, the Rio Celeste Waterfall and park system are known as relatively well-kept secret due to their remote location off the beaten path. 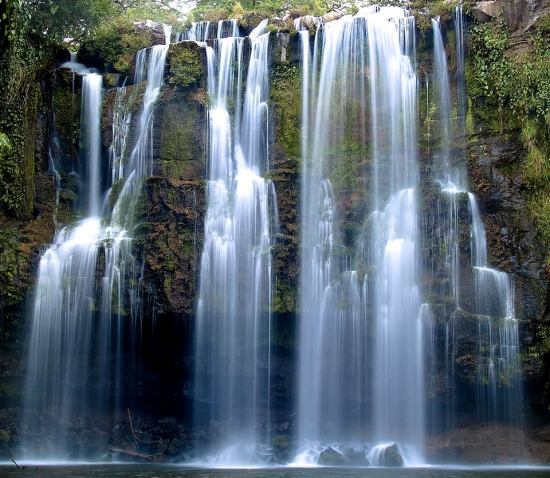 A hidden jewel in a country of treasures, the Rio Celeste Waterfall is not a sight to be missed. 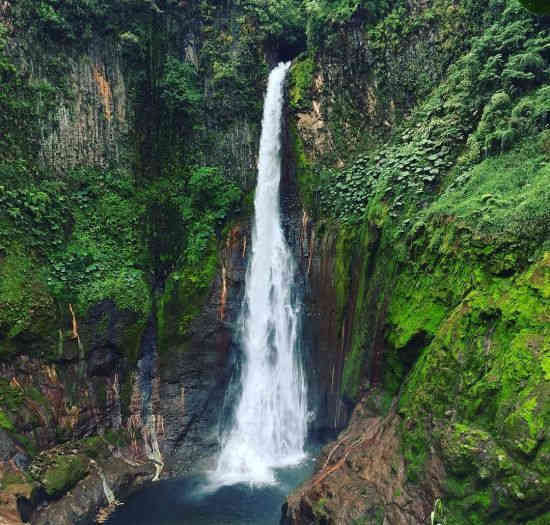 Located in the Cloud Forest outside of San Jose, the La Paz Waterfall Gardens are the most visited privately-owned ecological attraction in Costa Rica — and for good reason! The area is a combination of a nature walk, waterfall garden, and rescued wildlife preserve with over 100 species of animals. 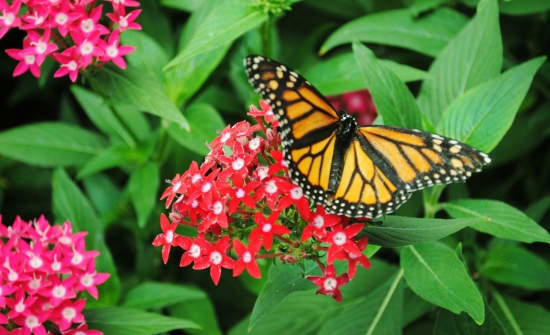 The preserve also includes a Butterfly Observatory, Serpentarium, Frog Exhibit, and Hummingbird Garden. You can expect to see the following animals in the gardens — over 40-species of birds including toucans and 26-species of hummingbirds, as well as marmosets, white-faced (Capuchin), and black-handed spider monkeys, two-toed sloths, jaguars, pumas, and ocelots, and a thriving frog exhibit. The La Paz Waterfall Gardens are open to the public year-round and the grounds are primarily self-guided, so visitors can tailor their experience to see exactly what and how much they’d like to see. With so many of Costa Rica’s wildlife and tropical sights to take in, it’s quite easy to spend an entire day touring the gardens and waterfalls at La Paz Waterfall Gardens. What a sight to behold! As one of the most spectacular and largest waterfalls in the country — with a 90-meter (300-feet) drop — Bajos del Toro Waterfall is tucked away in a valley between the Poás and Rincon de la Vieja Volcanoes, located in the Bajos del Toro Cloud Forest about 1 1/2 hours from San Jose. We highly recommend staying at El Silencio Luxury Lodge for the full Bajos del Toro experience. Hike the winding trail down to the base of the waterfall for about an hour with a guide and get up close to the roaring mist of this natural spectacle. The surrounding streams and pools allow for visitors to observe unique Costa Rican plants and animals species. Because the area is not heavily populated with tourists, you will also see an abundance of wildlife — from blue morpho butterflies to armadillos, and plenty of hummingbirds thanks to the feeders along the hiker facilities and nearby restaurants. 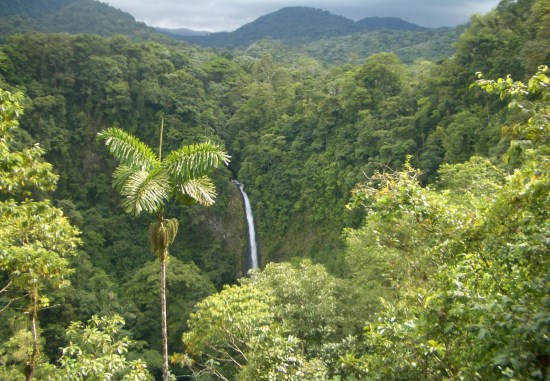 The stunning Nauyaca Waterfalls are located in the South Pacific region of Costa Ballena, just 20 minutes from Dominical. Though featuring less impressive drop-offs than the towering La Fortuna or Bajos del Toro waterfalls, Nauyaca is unique in its layout – it’s split into the upper and lower cascades; water pours over the cliff side to fall over 140 feet before the next 60-foot drop. One of the most amazing things about this waterfall is the location. Remotely tucked into the deep rainforest, the trip there might be a bit of work, but the views are worth it! 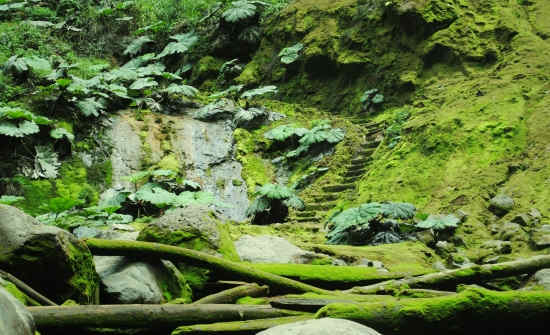 Guests have a few options for getting to the falls: horseback riding, hiking, or via 4×4. The hikers and horseback riders use the same well-maintained trail – keeping an eye out for the abundant wildlife in the area, such as monkeys or birds! This is a favorite home for a number of hummingbird species. The trail to the waterfall is roughly 2.5 miles, an easy hike that isn’t too difficult for children. Once arrived at the waterfall itself, the trail splits into two, bringing you to either the upper or lower falls. The upper falls are impressive, falling for a greater distance. The occasional mist blowing off the waterfall is refreshing after the hike, and there are a number of smooth river rocks that are the perfect location for your picnic lunch! The view is impeccable, and it tends to be more tranquil at the upper falls. The lower falls, however, are where the fun is truly at! Right before the steps down to the falls are facilities where travelers can change into swimsuits. The cascade falls into a large pool of clean blue water – a perfect, natural swimming hole. Taking a dip is the best way to cool off after the hike. There’s plenty of room for everyone to swim, relax, or explore, with the occasional entertainment of a daring local jumping from one of the cliffs. 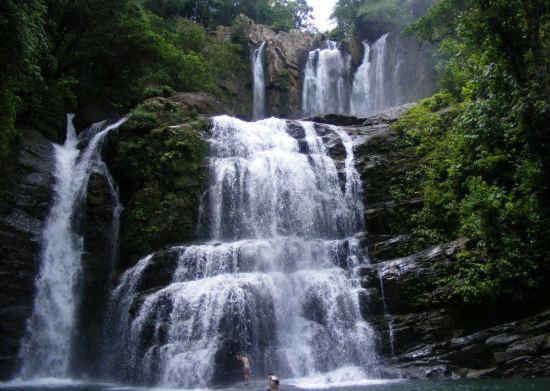 For amazing photo-ops and a great combination of hiking and swimming, the Nauyaca Waterfall is not to be missed! Prev Post: What is Consciousness?